Paul John Sweeney (born 16 January 1989) is a Scottish Labour & Co-operative Party politician. 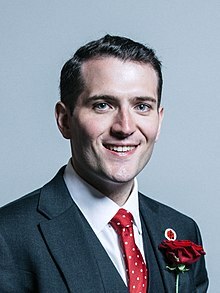 He has been the Member of Parliament (MP) for Glasgow North East since the snap 2017 general election, where he defeated sitting MP Anne McLaughlin of the SNP by 242 votes, overturning the 39% swing against Labour in 2015, which was a record swing in a UK general election. Sweeney was born at Stobhill Hospital in Glasgow on 16 January 1989 to Anne Patricia Sweeney (née Doherty), a bank clerk and John Gordon Sweeney, a shipyard worker. He was brought up in Auchinairn, and Milton, where he helped care for his grandmother as a young child. Sweeney attended St. Matthew's Primary School and Turnbull High School in Bishopbriggs. The first member of his family to attend university, Sweeney studied at the University of Stirling, gaining a Certificate of Higher Education with Distinction in Economics and Political Science, before continuing his degree at the University of Glasgow, where he graduated with a first class MA (Hons) in Economic History and Political Science in 2011, achieving the prize for best joint honours performance in Economic History, including a research project on the post-war economic development of Yarrow Shipbuilders, the Fairfield Shipbuilding and Engineering Company and Upper Clyde Shipbuilders. At university he also became involved in debating with the Glasgow University Dialectic Society, of which he is an honorary life member. As of 2018[update], he is a trustee on the Glasgow University Union's board of management. At the age of 17, Sweeney joined the Army Reserve, initially serving in the Royal Corps of Signals with 32 Signal Regiment, before transferring to 52nd Lowland, 6th Battalion of the Royal Regiment of Scotland. He is currently one of three Labour MPs to have served in the British Armed Forces. After undertaking an internship with BAE Systems at Portsmouth Naval Base as an undergraduate, Sweeney joined the company's graduate development programme with BAE Systems Maritime – Naval Ships in 2011, based at the Govan and Scotstoun shipyards on the Clyde, where he undertook a series of roles in production engineering and shipbuilding operations management on the Type 45 destroyer, Queen Elizabeth class aircraft carrier and Type 26 frigate programmes. Whilst at BAE Systems, Sweeney also initiated a project with the Glasgow School of Art's Digital Design Studio to introduce virtual reality methods into complex warship design and construction. At the end of 2015, Sweeney joined the national economic development agency Scottish Enterprise as a senior executive, working with the leadership of companies across the defence, marine, shipbuilding, aerospace and engineering sectors based in Scotland. In April 2016, he was elected as a Council Member of the Institution of Engineers and Shipbuilders in Scotland (IESIS). Sweeney joined the Labour Party at the age of 16 and first became an active campaigner during the 2009 Glasgow North East by-election. While working in the shipyards he joined the Unite and GMB trade unions, later joining PCS whilst at Scottish Enterprise. He is also on the executive committee of the Scottish Fabian Society. Sweeney came to prominence during the 2014 Scottish independence referendum, after he organised an open letter signed by young shipyard workers opposing the break-up of the UK, and subsequently spoke at a rally alongside Gordon Brown on the eve of the referendum. Sweeney's first experience of standing as an election candidate was in the 2016 Scottish Parliament election, where he placed twelfth on the Scottish Labour Party's regional list for West Scotland. In the 2017 general election he stood for Glasgow North East where a 12% swing to Labour led to him defeating Anne McLaughlin of the SNP by 242 votes. McLaughlin had taken the seat from Labour in the 2015 general election and she had been elected with a 39% swing, which was the largest swing in a general election. The seat and its predecessors had previously been held by Labour MPs since George Hardie in 1935. On 3 July 2017, he was appointed by Labour leader Jeremy Corbyn as the Shadow Under-Secretary of State for Scotland. He made his maiden speech to the House of Commons on 13 July 2017, during which he expressed his opposition to Tory austerity policies that had led to a fall in living standards. During the 2017 Scottish Labour leadership election, Sweeney endorsed Richard Leonard, who was ultimately the successful candidate. In November 2018 he won 'Best Scot at Westminster' in the annual Scottish Politician of the Year awards, in part in recognition for his lobbying of the Home Secretary and Prime Minister in asylum cases such as that of Giorgi Kakava, a 10-year-old orphan who had been threatened with deportation following the death of his mother. Sweeney has an interest in built heritage and architectural issues in Glasgow. He is a member of Glasgow Building Preservation Trust and has led walks as part of Glasgow Doors Open Days Festival for several years. Sweeney was also involved in the restoration of the historic former Govan shipyard head offices into the Fairfield Heritage Centre, for which he won an award. After campaigning against the demolition of Springburn Public Halls in 2012, he founded the Springburn Winter Gardens Trust, which is working to restore the nearby Springburn Winter Gardens. ^ Sweeney, Paul. "Twitter post". Twitter. Retrieved 19 August 2017. ^ "Mr Paul Sweeney MP". UK Parliament. ^ Rodger, Hannah. "Twitter post". Twitter. Retrieved 9 June 2017. ^ "Michael and Paul fired up for Army adventure". Kirkintilloch Herald. 7 January 2009. Retrieved 8 March 2018. ^ a b "17 From '17: Paul Sweeney, From Glasgow's Shipyards To The Green Benches". Huffington Post. 2 November 2017. Retrieved 6 January 2018. ^ "MyGlasgow News". Glasgow University. ^ "Profiles of the new Scottish MPs". Holyrood Magazine. ^ "Order Paper". Glasgow University Dialectic Society. Retrieved 8 May 2018. ^ "Board of Management". Glasgow University Union. Retrieved 8 March 2018. ^ "Michael and Paul fired up for Army adventure". Kirkintilloch Herald. ^ Sweeney, Paul John. ukwhoswho.com. Who's Who. 2018 (February 2018 online ed.). A & C Black, an imprint of Bloomsbury Publishing plc. Retrieved 14 February 2018. ^ "Sweeney, Paul John". Who's Who. ^ "2014 World Naval Review". Seaforth Publishers. ^ "Virtual Reality Transforms UK Shipbuilding". YouTube. ^ "Virtual reality warships: Why BAE is diving into 3D". The Telegraph. Retrieved 4 March 2018. ^ "Who are Scotland's new MPs?". BBC News. 9 June 2017. Retrieved 16 June 2017. ^ "Council and Office Bearers". IESIS. ^ "Who's who on the Scottish Labour left". Morning Star. 3 May 2016. Retrieved 6 January 2018. ^ "Statement on the Clyde shipbuilding industry". Labour Hame. 3 May 2016. Retrieved 6 May 2018. ^ "Scottish independence: Young shipbuilders express 'Yes' vote concerns". BBC News. 15 September 2014. Retrieved 6 January 2018. ^ "Only a No vote will save the Clyde". YouTube. 17 September 2014. Retrieved 6 January 2018. ^ "Labour Argue "Vote No" For Better Jobs in a Stronger Scotland". Economic Voice. 15 September 2014. Retrieved 6 January 2018. ^ "Live Blog". Labour List. 15 September 2014. Retrieved 6 May 2018. ^ "Scottish Labour announce list candidates for May's election". Labour List. Retrieved 9 January 2018. ^ "Election 2017: Glasgow North East". BBC News. Retrieved 9 January 2018. ^ "Reshuffle 2: The Maintenance of the Malcontents". New Socialist. 2017-07-08. Retrieved 2017-07-10. ^ "Passchendaele". Hansard. 13 July 2017. Retrieved 6 January 2018. ^ "Tories leaving people between destitution and starvation says new Glasgow MP". The Herald. 17 July 2017. Retrieved 8 March 2018. ^ "Sweeney declares his support for Leonard in race to be next leader of Scottish Labour". The Herald. 15 September 2017. Retrieved 6 January 2018. ^ "Jeane Freeman named Scotland's Politician of the Year". BBC News. 23 November 2018. Retrieved 3 January 2019. ^ "Paul Sweeney: How Glasgow's derelict land is limiting the city's ability to flourish". Common Space. 28 August 2015. Retrieved 6 May 2018. ^ "A third of new MPs have arts and culture links". Arts Professional. 13 June 2017. Retrieved 6 May 2018. ^ "Springburn reunion marks campaign to restore derelict winter gardens". Common Space. 21 September 2016. Retrieved 6 May 2018. ^ "Manufacturing Champions 2014" (PDF). Works Management. ^ "Save_facade_of_Springburn_Public_Halls_from_imminent_demolition". The Herald. 27 December 2012. Retrieved 6 May 2018. ^ "Campaign to save decaying Springburn Winter Gardens needs help from an architect". Glasgow Live. 2 Feb 2018. Retrieved 6 May 2018.